A curator's work is usually associated with historical ephemera and artefacts or ancient specimens. It is rare to get the opportunity to curate history as it happens. And then it happened here in Penzance, Cornwall yesterday when local woman, Helen Glover, and her partner Heather Stanning, won TeamGB's first Gold Medal in the London 2012 Olympics, while also being the first British women to ever win Olympic Gold in a rowing event. They won the Women's Pairs in 7 min., 27.13 sec., having already set an Olympic Record for the event of 6 min 57.29 sec. in the heats on 28 July on the Eton Dorney 2,200m rowing course. Helen and Heather have captivated the nation, not only because of their success, but because of the stories behind both women's entry into top-flight sport (Helen, an talented sportswoman, hockey player and PE teacher only started rowing in 2008). From a Cornish point of view, the win has placed a spotlight on the Duchy and on west Cornwall, particularly Newlyn where Helen grew up and Penzance where she went to Humphry Davy School. Today's national papers were full of stories about the pair, albeit that their place on several front pages were significantly diminished by much more prominent photographs of Bradley Wiggins, with the exception of the Independent's i Newspaper and the Daily Mail who gave equal weighting to the two stories. Perhaps that's because his win came afterwards, or maybe because his win was considered the more significant? It isn't unusual, even today, for women's achievements to be considered slightly less newsworthy, especially when a male achievement has come hot on their heels. Olympic women's sport is reported differently to that of men, a report reveals. Although several have commented already on their feat's worthiness to make history. But as the Curator of a nationally-important collection on women, Helen Glover's achievements deserve to be recorded and collected for posterity as the best a positive female role model can offer. It is my job to ensure that Helen's story is preserved for Cornwall for future generations. The opportunities for collecting have spanned digital and physical media, and of collecting memories. It's hard to be objective about collecting and recording major achievements like this. You tend to go into souvenir hunter mode, setting your sights on what you think is the most important and most auspicious, but as you will read below, that's not what recording for history is all about. When the whirlwind surrounding Helen's win dies down, it is even more important for the Elizabeth Treffry Collection to keep recording. In just over 24 hours my collecting frenzy has taken me to places I might not usually go, to observe and absorb. So here it is, 24 hours of curating gold. So read the headline in The Cornishman on 26 July, accompanied by a photograph of a beaming Helen. Then one of the many TeamGB Olympic gold medal hopefuls, she is quoted as saying that the "support she gets from the people of west Cornwall will give her an "extra edge" as she rows for gold..." By Saturday 28 July Twitter was abuzz with congratulations and excitement at Glover and Stanning's Olympic Record-breaking race during the first heat, being dubbed by some as a 'Cornish Olympic Record'. On 31 July further news was broadcast via Twitter that the race final would be screened at Penzance Hockey Club, where Helen used to play, and so it was here that I decided to start. Rooting for someone doing something so globally public in their home town is an experience in itself. Penzance Hockey Club is an unassuming sports club tucked away behind council offices. There were media vans in place, cameras up, ready to record the willed-for winning moment. A row of children with Union Jacks were put in place in the front row and various people were earmarked for reaction and interviews. And so at 11.50am people settled down to watch the race while the press watched us watch the race. Cheers at every milestone became more frenzied, peppered with sharp intakes of breath as the picture kept freezing. A moment of anxiety when Australia were closing in was quickly allayed when Helen and Heather swept passed the winning line and collapsed in a heap. We were on our feet, fists punching the air, all recorded for posterity by BBC Cornwall. As you will see from the BBC's interview with Helen's former teachers there was a very real sense of immense and sincere pride and admiration for someone who had an otherwise normal upbringing, went to a regular school, did a normal job but whose inner strength, focus and dedication has propelled her to greatness. What the BBC Cornwall coverage didn't show were the two rounds of the Cornish Oggy Oggy Oggy rallying chant joined in by everyone at the club at the end, highlighting that the crowd considered this a very Cornish win (and I am sure Scots felt the same about Heather Stanning). [The Cornishman] Should be renamed The CornishWOman! Helen Glover and Heather Stanning's firsts extended to firsts for Olympic-themed commemorative acts and in true Brit style Royal Mail stepped in with two innovative ideas. Each gold medal-winning athlete would have a Post Box painted gold in their chosen home town and immediately on their win, RM would release special Gold Medal Winner stamps. 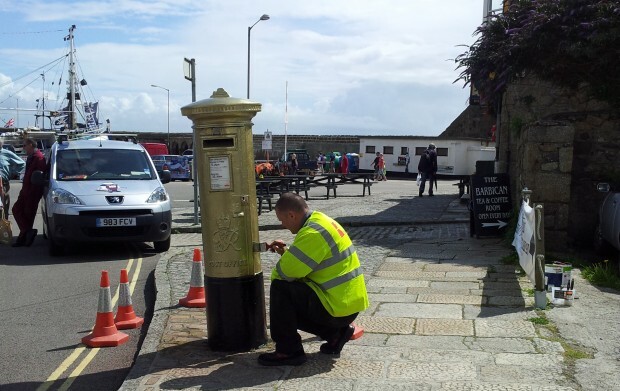 So Penzance got Great Britain's first golden Post Box and the very first special stamps showed the two women rowers upon crossing the finishing line. In another first, Helen and Heather became the first all-female sports team to appear on a Royal Mail stamp. So earlier today I went on the trail of recording and collecting these firsts. Arriving at Penzance Post Office at 11am, I was told to come back at Midday. In the meantime I headed to the gold post box, situated by the seafront on Marine Parade. The first images of the conversion from red to gold were circulated by artist and photographer Lee J Palmer who spotted the priming work early in the morning. I was glad to have seen the painters putting the finishing touches on the box. I think they were a little taken aback at the great interest shown in this phenomenon but they were happy for people to snap away and take their own little piece of history home with them. As I arrived one Penzance tourist was waiting to post a card to her daughter. She got the painters to dab a bit of this hallowed gold paint on her card, and then posted it. Sorry, they're all gone. They only sent us 80! After taking a few snaps of my own I headed back to the Post Office just before Midday only to be confronted by camera crews and a queue headed out of the door. Who'd have thought that stamps would make such a comeback one day! The first person to buy the rowers' Gold Medal Stamp was interviewed, photographed and generally made a fuss over. By the time I got to the queue I knew I would be faced with the inevitable reply: "Sorry, they're all gone. They only sent us 80! We're trying to get some more. Do you want the cyclist?" So much for a First Day Cover (or an understanding of the demand that is created in someone's home town). What I wanted for the Elizabeth Treffry Collection was to have a Penzance franked cover sent to the Hypatia Trust at Trevelyan House to found a new sporting women archive. This portrait of three brilliant women sums up what we're all about. In one moment I felt like I had let the collection down and that I failed in acquiring a requisite piece of Cornish women's heritage. And then it dawned on me that I was barking up the wrong tree. It did not seem in any case that these particular First Day Covers would be franked with the local postmark, which is what I was after for the collection. So I decided to go Blue Peter. I ordered a run of stamps and a First Day Cover for the collection online and then, in order to get a Penzance frank on something celebrating the women's success, I whipped off the front page of the Western Morning News which held an excellent photograph of the rowers, folded it up to make an envelope, sealed it with two regular Olympic stamps and popped it in the Helen Glover gold Post Box in time for its last collection on its first day. I was also delighted that BBC radio and news journalist Victoria Derbyshire let me use her photograph of the winning women on this blog. This portrait of three brilliant women sums up what we're all about. Yes it is important to collect these things as they are the memory triggers that allow history to form. But they are not what collecting for Women in Cornwall and the Isles of Scilly is all about: we're not magpies. Sporting women is an area that the collection currently lacks books and papers. As Curator I want to expand in this area and what better inspiration than Helen Glover's incredible win? This is what celebrating a golden girl is really about. But it's the stories that led to the win and how she builds upon it and becomes a positive female role model that Cornwall and Scilly desperately needs, that we want to document too. Even before the Olympics began Helen was extremely keen on inspiring the children back in Penzance. She talked to them via video link, online and came in to tell them the story of her amazing journey in sport and rowing. She says she intends to come back to show the same kids her medal. This is what celebrating a golden girl is really about. All the attention that Helen Glover and Heather Stanning are rightfully getting has perhaps eclipsed the Olympic achievement of another Cornish woman rower, Wadebridge's Annie Vernon. Annie was part of the women's eight team that came fifth in the finals today but was an Olympic Silver medalist in Beijing in 2008. I was delighted that the BBC published an article on Annie highlighting the Cornish pride she feels when rowing at an international level. She carries St Piran's Flag (Baner Peran) on her rowing oars and according to her mother, Morwenna Vernon, she bonded with her team mates by making them each a "mean Cornish pasty." If you're reading this Helen, Annie Julie or any other sporting women of Cornwall and Scilly, please get in touch! We would love to make sure that your achievements become part of our future heritage. I haven't yet counted up the Cornish women competitors in this Olympics, nor sporting women who compete in events outside of this arena, but it is perhaps time to do so and publish stories about them here. Part of the problem we have with women's visibility, not least in sport, is that we don't often enough hear about them and their achievements. Women like Helen Glover, Annie Vernon and another Cornish sporting heroine from Penzance, World no. 1 Muaythai boxer Julie Kitchen all have a place in the heritage of Cornwall and Scilly. Sport is an area that can be a major inspiration to young people, not least girls and young women. It is the job of the Elizabeth Treffry Collection to help make sure that happens, not just during the glory moments, but much beyond. So, if you're reading this Helen, Annie Julie or any other sporting women of Cornwall and Scilly, please get in touch! We would love to make sure that your achievements become part of our future heritage. If you're keen to put your oar in... see here for some top rowing training tips from Sports Fitness Advisor.